Top Players To Watch: QB Desjuan Kearse, Sr., RB/LB Keyshon Gardner, Sr., RB Calvin Montgomery, Sr.; WR/CB Johnquai Lewis, So. ; WR Marc Britt, So. ; DE/WR Gregory Rousseau, Sr.; LB Donovan Georges, Sr.; LB Donald Georges, Jr.; DE Jesus Machado, So., CB Noah Pierre, Sr. The Skinny: Champagnat Catholic returns to the 2A state championship game and they face the same team they played a year ago in University Christian. The Lions dropped a sometimes ugly 24-8 decision a year ago at Camping World Stadium in Orlando. This is the only rematch of state finalists from a year ago. Champagnat is a fairly balanced offense, with 171 rushes for 1,626 yards or 9.5 yards a carry and throwing for 1,610 yards on 100 pass completions. QB Desjuan Kearse leads the offense, completing 74 of 92 passes for 1,192 yards and 17 TDs and only 5 INTs. It’s a two-headed rushing attack for Champagnat with Keyshon Gardner (52 carries, 612 yards, 11.8 average, 8 TD’s) and Calvin Montgomery (61 carries, 533 yards, 11 TD’s). The receiving numbers are fairly balanced, led by Marc Britt (23 receptions, 411 yards, 7 TD’s). Defensively the Lions have allowed only 88 points this season, and only 12 points in three playoff games. DE Jesus Machado leads the Champagnat defense (76 tackles, 31 tackles for loss, 19 sacks), and Gregory Rousseau (75 tackles, 10 for loss). Donovan Georges and Donald Georges have combined for 106 tackles, and Donovan has 16 tackles for loss as well as a kick return for a touchdown. CB Noah Pierre leads the secondary with 4 INT’s and also has a punt return for a TD. Top Players To Watch: QB Clay Boyd, Sr.; RB Jalen Dunning, Sr.; RB Max McClendon, So. ; WR Jon Jones, Jr.; WR T.J. Ciresi, Sr.; LB Shannon Mickens, Sr.; TB Uriah Ratliff, Jr.; TB Josh Worthy, Sr.; FS Dyrell Stubbs, Sr.; DT Chris Lewis, Sr. The Skinny: University Christian is back to Orlando, looking to three-peat as 2A state champions. Running backs Hussein Howe and Otis Anderson was the story in the last two state championship wins for the Christians, but this year the offense leans on quarterback Clayton Boyd. Boyd rushed for 528 yards and threw for 1,210 yards in leading University Christian to a 10-2 record with the only losses coming at 1A state finalist Madison County and 5A playoff team Green Cove Springs Clay. Boyd is a dual-threat QB, but University Christian is a run-heavy team with RB’s Jalen Dunning and Max McClendon leading the ground game. Jon Jones and T.J. Ciresi are the leading targets through the air for Boyd. Shannon Mickens and Uriah Ratliff are the leading tacklers for the Christians with Chris Lewis anchoring the UC defensive line. Josh Worthy helps lead the linebacking crew, and Dyrell Stubbs leads the team in interceptions in the secondary. University Christian had a tougher road to Orlando than Champagnat but only allowed 20 points in their three regional playoff wins. This is the only rematch from last year’s state championship game, as University Christian completed a repeat as 2A state champions with a 24-8 win over Champagnat Catholic at Camping World Stadium a year ago. Unlike their 61-16 win over Cambridge Christian in the 2A title game in which UC ran wild, last year’s title game victory for the Christians over the Lions was more about defense and special teams. 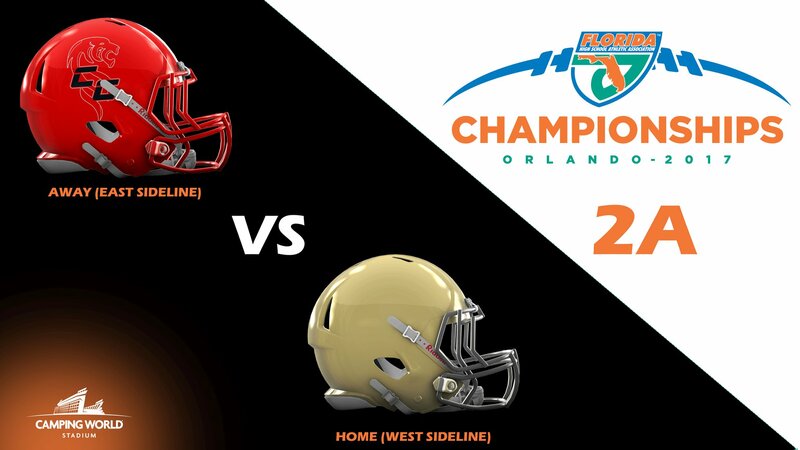 The defense will be at a premium once again in this championship game, as Champagnat has allowed only 88 points in 10 games this season, and only 12 points in the postseason, including back-to-back shutouts against Moore Haven and Cambridge Christian in the regional finals and state semifinals. University Christian has allowed only 20 points in their three playoff games, with 13 of those coming in a win over North Florida Christian in the region finals. Experience shouldn’t be a factor as both teams were here a year ago, but it may be a difference at quarterback as Clay Boyd is the first Northeast Florida quarterback to start three state title games in a row since Union County’s Andrew Zow from 1994-96. That may be the difference in this game, as Boyd is battle-tested, with Champagnat QB Desjuan Kearse making his first state championship game start Friday morning in Orlando. This will be a grind-it-out game between two excellent defenses. © 2010-2019 Florida HS Football, LLC and FloridaHSFootball.com, All Rights Reserved. We love everyone that comes to FloridaHSFootball.com each and every day! How about giving us a little support to help us continue to be the top high school sports website in Florida? To see what your support goes to, click here. To donate by Check or Money Order, mail to Florida HS Football, LLC, P.O. Box 141601, Gainesville, FL 32614-1601.